I finally jumped in with 2 feet into the deep end, and made the switch from tampons to the Lunette Cup. It was the best period-related decision that I’d ever made. One of my only regrets was not doing it far sooner. Because I only switched in my early 30’s, I had all those wasted years. Money, hassle, and eco-disaster. Anyway, better late than never. It’s the same for you. Even if you’ve been using tampons your entire life, it’s not too late to make the switch now, even for only a few more years. Here are 5 things that happened when I made the switch to the Lunette. I hated spending money on tampons every single month. They’re kind of ridiculously expensive for what they—small pieces of cotton with a string attached to the end. Anyway, although the Lunette Cup was a bit more money up-front, I recouped my costs in only a few months. Then, it was years of saving money down the road for me. Cha-ching! Or, check Lunette Cup prices here. It’s possible to insert, and remove a tampon without actually touching any sort of menstrual fluid. You probably know what I’m talking about. You really could go an entire period without getting any sort of menstrual fluid on your hands. The Lunette? Not so much. You will get menstrual fluid on your hands almost every single time you remove your cup. But, is it disgusting? Not as much as I thought it would be. Honestly. I got used to it after a few times and now I don’t even think about it. Menstruating is a natural body process. Using tampons or menstrual pads allows us to be pretty far removed from that. Is it a good thing? I don’t really think so. Knowledge is power. Oh yeah, and it also wasn’t as difficult as I thought it would be to insert and remove it. I’d heard horror stories from my friends about menstrual cups getting stuck, etc. But, it never happened to me with the Lunette (thankfully). With tampons, I was always worried about leaving them in for too long because of the risk of Toxic Shock Syndrome. I’d change it out right before I went to bed, and then jump out of bed in the morning to take it out. 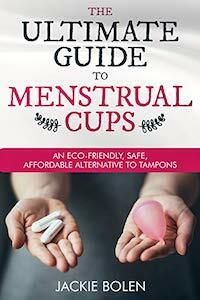 With a menstrual cup, you have up to 12 hours before you need to change it. The capacity is higher too—about 2-3x that of a jumbo tampon. I sometimes forget about my period. For entire half days. This never happened when I was wearing tampons. I used to panic during my period quite regularly. Did I buy tampons at the store last week? Do I have an extra one in my backpack? Are my brining enough with me on vacation? What if I can’t get to the store? Will I get TSS from leaving my tampon in for too long? How long have I left this tampon in anyways? Don’t these things have chemicals in them? Sound familiar? If yes, then make the switch to the Lunette. You’ll panic far less, trust me. I did. I’ve never really felt that great about disposable period products. I mean, the actual amount that I myself wast throwing into the landfill wasn’t that much. But…there are billions on women in the world, and many of them are menstruating. It adds up. I used to think about it. And I still do now. But, since I’ve made the switch to a menstrual cup, I feel better about doing my part to reduce the amount of waste that goes to the landfill during my period. Eco-friendly periods for the win! What Happened When you Switched? Have your Say! Tell us your thoughts. What happened when you switched to the Lunette Cup? Leave a comment below and let us know.